These gentleman are professional, courteous, and did an amazing job on my driveway extension last year. They gave us a fair estimate and completed the work on time, as scheduled (if not a little early). They used black gravel to extend our driveway and it looks amazing to this day. Our neighbors in front also got a similar driveway extension that matches ours. Whoever did that work didn't do a good job. They have weeds and grass growing through their gravel, while our gravel hasn't had a single growth in the last year. I highly recommend Austin Native Landscaping! I was unable to afford their top tier services for my first home. They were incredibly respectful and responsive even when I mentioned I could not afford their services. Erin was kind enough to say in the last email "I’m very glad to help Nick! Everyone should be able to get a great landscape regardless of price." Look forward to using them down the line! From start to finish, we have loved working with Reed and his team at Austin Native Landscaping. The initial quote was reasonable, and the quality of the work was exceptional. We had some stone repaired, a new fence put in, and some new landscaping done around the back and side of our house. The project took just a couple of weeks, and Jarrett and the rest of the team paid attention to all the little details- they even upgraded our irrigation near the new plants that were planted. I am SO happy with the outcome and would hire these guys again in a heartbeat! Reed, Andrew and the rest of the crew at Austin Native Landscaping were fabulous to work with. Reed was extremely responsive to my first inquiry and immediately gave us a plan to landscape the entire front yard after a giant Arizona Ash was removed. They worked with our schedule to make sure the work was done when it was convenient for us as we had some other drainage work that needed to be completed before they could landscape. Reed kept us well informed of the work each step of the way and they completed the work very quickly. Austin Native Landscaping clearly cares about the quality of the work and plants and it shows in the final product. I highly recommend them for any landscaping project! Reed and his team are great to work with. They were very responsive to my request for a quote, and provided excellent customer service throughout the project. I am very pleased with the work they did - removing old trees and shrubs, replacing them with drought-resistant but attractive plants, adding decorative rocks and lighting, and replacing several sprinkler heads in the process. The finished product was done on time, on budget, and will look great once everything starts to grow and fill in. I will definitely hire these guys for my next landscaping project and highly recommend them. My birthday was coming up and it was time to refresh the landscaping in our new home. My husband is a DIY type of man but the scope of the project was too great for him to attempt by himself.We wanted a complete redo: All the old patchy grass ripped out, good soil added, privacy shrubs and trees planted. A retaining wall built due to our sloping front yard. Old irrigation was shot and leaking bad so needed a new system. We also wanted a nice mortared flagstone pathway leading to the house. And finally, an Outdoor lighting to put the finishing touch on it all.At first we contacted multiple contractors for each trade and it was a huge hassle and mess. Half of them didn’t show up, the ones that did show up tried to upsell without listening to our original ideas. You can imagine with so many trades it took a master scheduler to meet with all of them. Some of them sent a bid after a month, some didn’t at all. Coordination of all of it was a nightmare as you had to work around all of their schedules. We decided it’s not worth the hassle and decide to find one company to do it all.We contacted 4 different companies after reading their reviews and looking at their portfolios. ANL immediately stood out. Their attitude is infectious; they are young but very knowledgeable and passionate about what they do. Their price was mid range amongst the 4 but their design, positive attitude and promptness sealed the deal.They were booked months ahead, and could start on our projects only 3 months after we signed the contract. But believe me when I say it was worth it. They showed up early and worked late. They stored all of their tools and materials neatly after each day and especially during the weekend. Awesome communication. Most importantly, didn’t try to upsell us and followed our original idea and guidelines.Work was done within 3 weeks and the result is spectacular. Everything looks cohesive. They keep answering our many questions months after the job is done. 2 of my neighbors were so impressed they are already getting bids from them so the work speaks for itself. Thank you! This company is unreal! Reed oversees the entire project daily! They show up at 7am each morning and are not a minute late! They work so hard and do an amazing job! I was in awe of the work ethic of this team and the end result! I would recommend this company 100%. Above and Beyond on so many levels: Communication, Ethics, Design/Planning, Pricing, Crew and Speed of Work.Reed and his crew are some of the most hard-working and sharp guys I have met. I got 3 bids on xeriscaping the front of my house and not only was Reed's quote the best but it also had the most design structure to it. When I initially reached out to him, he came back with 3 options for an initial meeting date/time and I had the first design back in only a few days. We made minimal changes but he sent me an updated plan each and every time.He has an amazing talent and knowledge for landscape design and his crew are some of the fastest working while attentive to detail I have seen (and I worked for a landscape company in Chicago over 10 years)! Every morning of the project, Reed would check-in with me on what they were going to do, time line of the overall job, any questions or changes I wanted and he would walk my property with me as we went over this to make sure that I was good and that we were on the same page -and he did the exact same at the end of every day.When I read prior reviews I kept thinking, "they can't really be THAT nice and the designs THAT amazing" -but they genuinely are, to the point that I bought them all breakfast on the last day of the project to thank them for not only finishing a day early but for how hard I saw them working each day (I work from home). The topper to all of this was that after they had cleaned up and finished on the final day, I had a request to make some last adjustments to one area of edging - which Reed noted and said they would take care of right away. Not even a few hours later, one of Reed's crew was back and making the adjustment and checking with me that it was correct.I'm already planning to have work done by them next spring on my back yard. I walk out my door or pull into my driveway and still can't believe this is my home. The difference with what Reed and his crew have done, has cars slowing down to look as they drive by and several neighbors coming by to ask who did the project. Hands down they are the best- get on their planning schedule while you can. Reed and team did a fantastic job on our front yard. After the initial consultation, they submitted the proposed design and bid within days (including contact info for actual past customers for reference purposes) and aside from a few tweaks, we didn't change anything about it.The work included a) replacing part of our front lawn and our entire garden bed in front of our house with drought tolerant plants, b) laying large pavers and creating a walkway from the street to our front door, c) installing a drip system to water all of the new plants, and d) adding a metal mulch ring around the tree in the center of the remaining lawn. The area around the pavers and plants was separated from the grass area with metal planter inserts in the ground and then the entire new area was filled with high end gravel. They were very clear about why they picked each plant and are clearly knowledgable about native Texas plants and bushes.The install took place over several days during Thanksgiving week. The project was completed on time and on budget, and turned out even better than we could have expected. ANL provided clear post-install instructions regarding watering and care and the plants have continued flourishing since the install. We'd definitely use them again and will keep them in mind for any future work. The Turks are invading and they are wielding adorable red caps! Do not mock Mock Orange as it is an excellent Texas adapted tree. Agarita is a tough sell; It’s thorny and scraggly. But its many positive characteristics are well worth considering. White Mistflower is a solid choice in any Texas native plants Xeriscape. American Beautyberry is an excellent section for shady spots in your landscape. A most useful shrub! This Texas native perennial is not only very deer resistant but is also an exceptional wildlife habitat provider. One of our absolute favorites! I am getting ready to put my house on the market and needed to do some landscaping work. I didn’t have a big budget and didn’t have a sprinkler system. 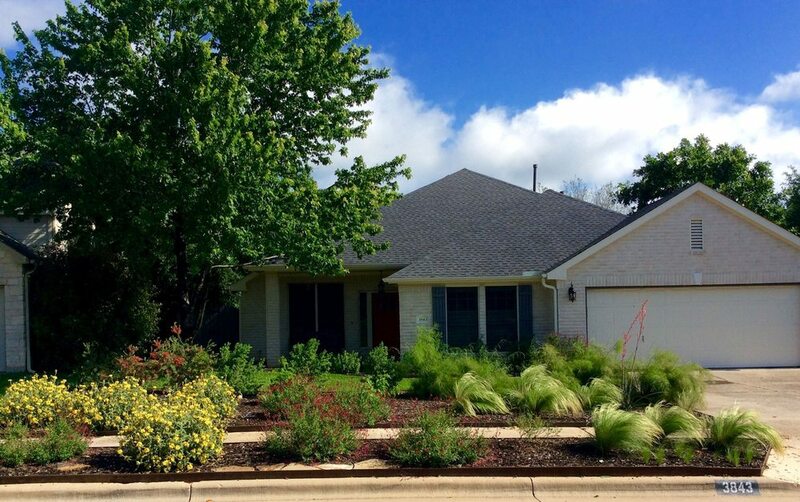 It made sense to do Xeriscaping and I contacted Reed & the guys at Austin Native Landscaping. Reed put together a plan that fit into the budget and he installed many native grasses, plants, stones, crushed granite & mulch. The transformation has been incredible and all of my neighbors have complimented the work. Our practice is very focused and specialized: We design with drought resistant, mostly Texas native perennials, installing truly spectacular and low maintenance landscapes. We don’t do decks, patios, masonry work or lawn care. We do one thing and do it well; Xeriscape Design, Installation And Maintenance. All the plants in our designs are available locally: we know it because we use them everyday.